At QC Krav Maga, we have seen for ourselves that Krav Maga can help you build confidence, get in shape, and learn self-defense. 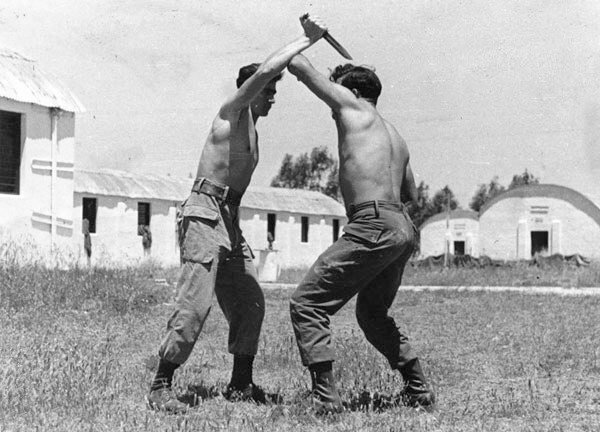 But in the 1930’s, you could say that Krav Maga originated out of necessity in order to mirror real world combat. The word itself loosely translates from Hebrew into “contact combat” and was created by Imi Lichtenfeld in his hometown of Bratislava. Here, Imi grew up with his father, Steven Lichtenfeld, a police officer and former acrobat. Steven had his own gym where he taught Imi wrestling and self-defense. With much success, Imi went on to win several national and international boxing and wrestling championships. When anti-Semitic riots broke out in Bratislava though, Imi knew that he needed a useful set of techniques to help fend off his attackers. So he combined what he learned from his Dad with the fighting he had to do on the streets. From that need sprang Krav Maga – a new form of self-defense. The situation in Bratislava even got so bad that Imi had to flee his hometown to Palestine, now Israel. Here, he began teaching self-defense to a paramilitary organization, called Haganah, while also working to create the independent state of Israel. The Haganah formed the Israeli Defense Force and Imi became the Chief Instructor of Physical Training and the teacher of what is now Krav Maga. It wasn’t until 1980 that Krav Maga reached the U.S. where it has become useful for the FBI, military, and civilians. Now, it’s taught in several martial arts schools, like our own at QC Krav Maga where many benefit from its unique philosophies and personal benefits. Imi formulated Krav Maga in order to stop threats quickly and retreat from danger safely. There are no rules, only a set of techniques and philosophies to live by in order to defend yourself while having respect for others. Some of these philosophies include, avoiding undue or unjustified use of force, having modesty, using peace-loving conduct, and maintaining a strict adherence to fair play. Imi’s methods and philosophies were even formulated to fit everyone, no matter their size or build. Instead, whoever might need Krav Maga can use it to save his or her life, as was the case in Bratislava, or use it to survive an attack while sustaining minimal harm. To learn more about how you can benefit from Krav Maga, read about its many benefits here, or learn about signing up for classes today where our team can teach you proper techniques, form, and execution.